Project “The road of Livonian tradition from Latvia’s independence to its centenary (a video overview of the period 1989-2014)” carried out by “Livonian Union (Līvõd ĪT)” with the support of State Culture Capital Foundation has ended. Project was realised with the help of National Library of Latvia and Latvian Academy of Culture. End result can be seen in the renewed Livonian portal www.livones.net. The project was started in 2014, when 25 videotapes were digitized. These tapes contained material about Annual Livonian Celebration, filmed by Livonian Imants Rūdolfs Petravis-Zariņš. 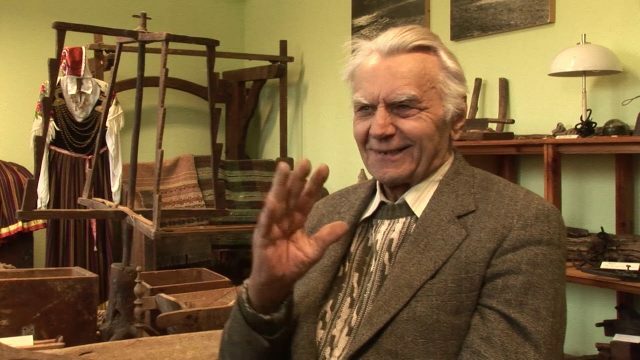 Audiovisual arts have been his passion for his whole life and he has selflessly devoted himself to commemorate different important events of Livonian community, one of which has been Livonian Celebration. Interview with him (in Latvian) has also been done within the framework of this project and can be seen in the portal. The decision to digitize this material was made because of the need to popularize contemporary Livonian events and traditions in diverse formats, also through visual media, and to make this information more accessible and easily perceptible. The strong side of the video is that it can vividly capture the practicing of this tradition and to show the people involved in this celebration. The goal of the project was to create a material that shows traditions of Livonians as a small community, whilst popularizing it and educating others. Project came to end in 2018, resulting in several short videos from Livonian Celebration in a 25 year period, that colourfully reflect different sides of contemporary Livonians – their traditions, culture, achievements. Videos are accompanied with short descriptions. The uniqueness of these videos can be found in the fact that they are a simple look at these events and people from the viewpoint of their own community member. The results of the project can be seen in: http://www.livones.net/en/kratuve/livu-svetku-video/ It is planned to expand the material provided now.